Hey, I moved into my new office space! 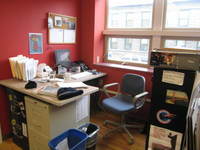 Here's a picture of my new desk in the red room. Anyhow, I was talking with someone who reads my blog the other day, and he lamented the fact that I haven't been posting as many online media-related items (Richard, this post is for you). I've been doing a lot of reading lately about trends in journalism online. At some point over the past few months, I stumbled upon Howard Owens' blog, and have since become a regular reader. Owens is the Director of Digital Publishing at Gatehouse Media. On his blog, he opines about the changing media landscape. I've particularly enjoyed his posts about newspapers doing video. Basically he argues that newspapers shouldn't try to produce the best, most polished video — he thinks we shouldn't worry so much about production values, because they don't matter as much online as they do on TV, at least right now. He wrote a post earlier this week called DIY video and punk rock. It's a controversial argument — the comments section of that particular post don't reflect the arguments Owens has been having with professional TV videographers. I'm not sure I agree that production quality is unimportant, but I definitely prefer attitude and style over videos that are polished but dull. Hence my enthusiasm for our new vlog, Stuck in Vermont. I see that the Burlington Free Press has about a godzillion videos on their site. I've seen a few. They're pretty professional. If I was in one, or knew someone in one, I'd probably check it out and pass along the link, but... is anyone else watching them? How much of an audience do you need to justify spending money shooting, editing and producing online video? I noticed that the video of the spelling bee carries a 30 second ad for Saturn. What do people think about putting ads on videos? The Saturn ad didn't bug me too much but I didn't find the Freepress videos too interesting. Most of them seem to be sports-related and so straight forward that it hurts. Obviously, I am a bit biased here and prefer documentary-style, low fi vids to polished and dry. But beats me what the general public prefers?? I see nothing wrong with reaching for high production value on the web. However, the Internet is not TV and it's moving in the wrong direction to treat it that way. I think that's why you see polished videos that are dull. The web gives filmmakers and video artists a new medium in which to tell stories, and a freedome to play around with things you can't get away with on TV. Quality picture, sound, editing and acting should still be sought after. If it's worth doing, it's worth doing well. and they produce videos with better production values. maybe they have seen the Present State of news consumption. Whatever pays for it works fine, it's not like Saturn is dictating the content, just paying for eyeballs.